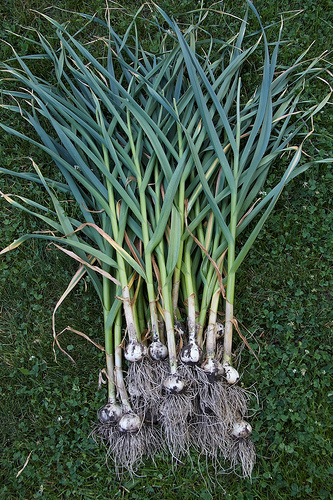 Now that it’s out of the ground, I’m pretty sure I had the variety of my garlics mixed up. I think the smaller one is Purple Glazer (above), and the larger one is Music. The larger variety doesn’t seem to have a hint of purple skin. I have half a mind to call Richter’s Herbs, where I bought the garlic, to see what they think, but I suspect that I’m (now) right. Both varieties were looking like they were nearly ready to harvest, so tonight I decided to dig a few up from each type to take a look. They looked good and we have a couple nice days ahead, so I decided to pluck up the whole crop so that it can cure over the weekend. We’re expecting some rain Sunday afternoon so I’ll likely have to bring it into the garage or the basement to finish up, but… hooray! I’m thrilled with how my garlic has turned out this year. 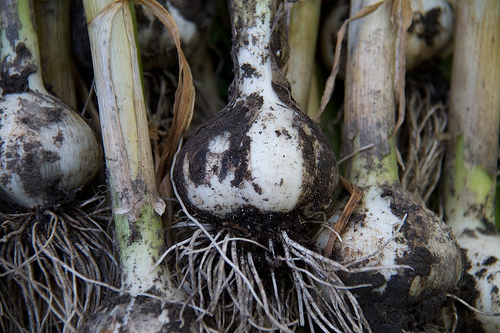 The first year I tried growing garlic, I planted it in the wrong season (tip: don’t get suckered into buying the seed garlic they sell in virtually every garden centre and store in the spring! 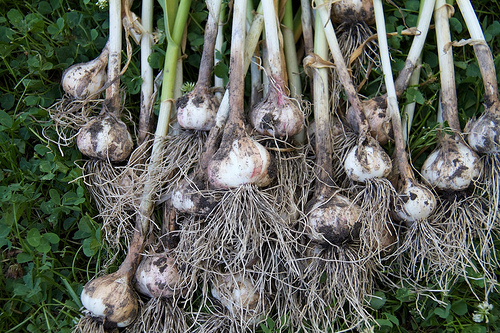 Garlic needs to be planted in the autumn!). Then the cloves separated and re-sprouted the next year all over the garden. I harvested that stuff but it was a mess, and the cloves were small and difficult to use. Finally last growing season I planted it at the right time but the heads of garlic were small and I think I had planted them too deep. I used them too but again, really small garlic is a pain to peel and cook with. Last fall I bought the two varieties from Richters and got them in the ground at the right time, and I made a conscientious effort not to bury them too deep (I wasn’t quite so conscientious about labelling them however). The same improved planting technique has yielded much better results with my other alliums too. Pictured above are my shallots. They keep trying to flower and I’ve clipped back the flower stalks regularly but I figure they could be picked and cured too. My yellow Spanish onions are growing to a nice size too. Finally! Good-sized onions!! With all my gardening experience, getting good yield in my onions has alluded me until this year! I bought the Spanish onion sets from a bulk bin at a farm supply store near my parent’s farm — rather than the ones I usually pick up that McKenzie supplies to the garden centres. Not sure if that made a difference but I wouldn’t doubt it. I read somewhere that you can plan shallots in the autumn. 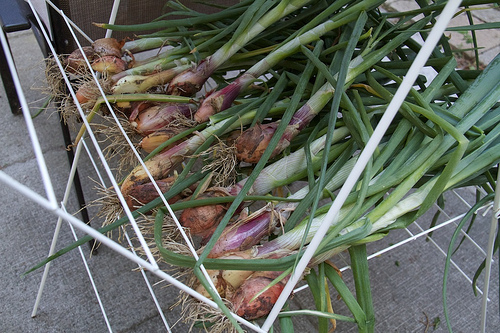 I don’t know if I can find shallot sets for the fall but I’d like to give it a shot if I can. If anyone knows anyone who I could order them from in September, I’m all ears! I’ve yet to grow large onions, they are my nemesis 😉 Heritage Harvest Seeds might have some multiplier onions set in the fall, they are basically shallots. If not you can always sow shallot seeds this fall.